Electoral rolls are the nearest thing Australians have to census records, and hence are extremely important genealogy tools for local, family and social historians exploring ancestry. If you're building a family tree or exploring your family history, they're an absolute must! "What records are included in this set?" 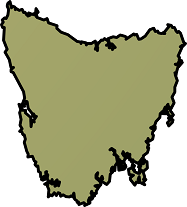 Included are the commonwealth electoral rolls from two separate years, 1934 and 1943, for the following regions of Tasmania: Bass, Darwin, Denison, Franklin and Wilmot. They hold the details of thousands of voters who resided in Tasmania at this time, and who were entitled (and registered) to vote. Importantly, the roll includes the names of many women qualified to vote for the election of members of the Commonwealth parliament. "What information will I find on my ancestors in these rolls?" The electoral subdivisions of Bass covered are: Flinders, George Town, Launceston Central, Launceston East, Launceston North, Launceston West, Lilydale, Portland, Ringarooma, Scottsdale and St Leonards. Maps of each subdivision are included. The electoral subdivisions of Darwin covered are: Circular Head, Devonport, Emu Bay, Gormanston, Kentish, King Island, Leven, Penguin, Queenstown, Strahan, Table Cape, Waratah and Zeehan. Maps of each subdivision are included. The electoral subdivisions of Franklin covered are: Clarence, Esperance, Glenorchy, Huon, Kingborough, Moonah, Nelson, New Norfolk, Port Cygnet, Richmond, Sorell, Spring Bay and Tasman. Maps of each subdivision are included. The electoral subdivisions of Wilmot covered are: Beaconsfield, Bothwell, Brighton, Campbell Town, Deloraine, Evandale, Fingal, Glamorgan, Hamilton, Latrobe, Longford, Oatlands and Westbury. Maps of each subdivision are included.